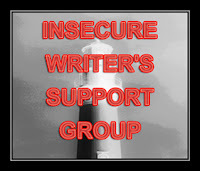 The Insecure Writer's Support Group is hosted by Alex Cavenaugh. Well, today is the day of The Sweets Blogfest. It's the first blogfest I've hosted in two years, so I'm nervous to see how it goes over. And it's to promote my novella The Other Marlowe Girl and my friend's novella Advantage Heartbreak, so that makes it even more nerve wracking! We need this to go over well! If you have time, please check out our Sweets Blogfest. Hey, Beth. Congratulations, again, on signing!!! No worries on missing the blogfrest, and thanks for stopping by and the well wishes. And confidence is so rare for me. the blogfest has been sweet! Thanks for hosting it!! Very sweet blogfest. Congratulations to you on your agent signing and just keep thinking the next book will be even better. Congrats on the new agent Beth! I'm looking forward to hearing more good news from you in your future posts. It is soo long and hard! Congrats on your novella and the agent. That's a lot of awesomeness! Authordom is a tough road. Lots of bumps. Celebrate the nonlumpy parts. My congratulations again, Beth. I posted something for you at yalichat about a week ago, but good wishes are fun to give double. Good luck with your hop!